To tell you the truth, I wasn’t so sure about this one. 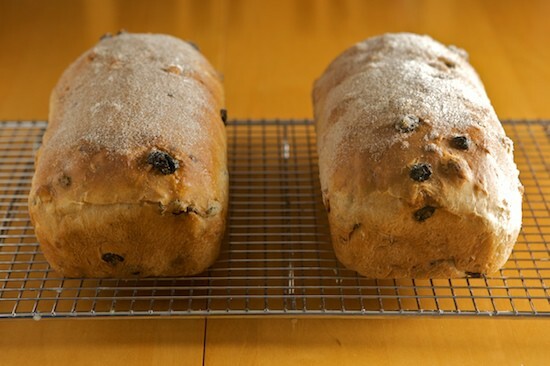 I love raisins, but I generally prefer my cinnamon bread to be raisin-free. And walnuts? Well, they’re great in banana bread, but again, I like my cinnamon bread the way my mom made it, thank you very much. But I was wrong. So so so wrong. Not about my mom’s Cinnamon Swirl Bread, of course. That one will always be a favorite. But this Cinnamon Raisin Walnut Bread is now tied with Casatiello as the favorite bread I’ve baked so far in The Bread Baker’s Apprentice Challenge. This bread is good. And I mean really good! For the majority of my breads, I have been using one of two flours: unbleached bread flour or unbleached all-purpose flour. I always mean to mention the brand of flour I’m using for each bread, but up until today, I’ve forgotten to include the information. The majority of breads we’ve baked so far have used unbleached bread flour. I started out using King Arthur’s bread flour, but then ran out and ended up buying Gold Medal’s ‘Better for Bread’ flour. As you’ve seen in my previous posts, both flours produce excellent bread. But recently I’ve been using another brand of flour that is fairly new to me. Shepherd’s Grain is a flour company in the Pacific Northwest that I learned about during the International Food Blog Conference in Seattle. Karl Kupers, a co-founder of Shepherd’s Grain sat on the “Passionate Purveyors and Producers” panel and talked to us about sustainable agriculture. Shepherd’s Grain has 33 growers farming wheat for their flours and they all use sustainable agriculture farming methods and are certified by the Food Alliance Association. Want to meet the farmers? Before learning about Shepherd’s Grain, I didn’t even know that wheat was grown in the Pacific Northwest, much less that a revolution in farming was taking place there. I had the pleasure of meeting Karl and his wife Lexie at the conference and they were very excited to learn about The Bread Baker’s Apprentice Challenge. They even offered to send me some samples of their flour for me to try out during the challenge. I used Shepherd’s Grain Unbleached High Gluten Flour for the Ciabatta and it was perfect! I also used their all-purpose flour (sold under the brand Stone-Buhr) for the Cinnamon Buns. And if you saw those buns, you know they turned out well. I used the rest of the high gluten flour for this Cinnamon Raisin Walnut Bread, again with absolutely wonderful results! I wouldn’t say that any of the brands of flour I’ve used so far have performed better or worse than others. As long as you’re using the type of flour called for in the bread formula, you should end up with decent results regardless of brand. 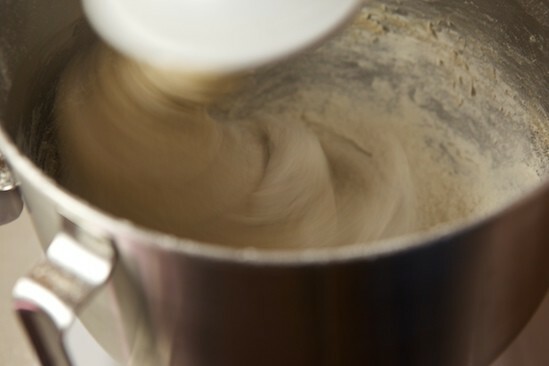 But I particularly enjoyed using Shepherd’s Grain flours because after learning about the farming practices and meeting Karl and his wife, I felt a personal connection to the flour. 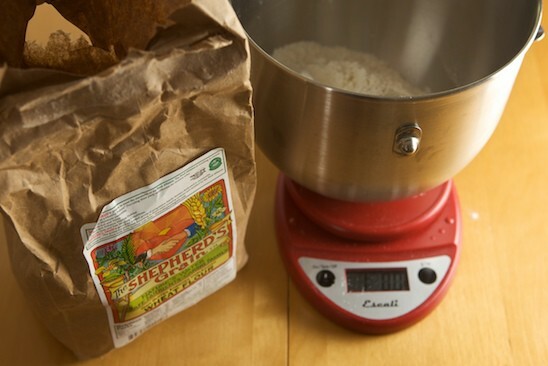 If you live on the west coast you can buy Shepherd’s Grain flour under the brand name Stone-Buhr flour. I have not yet searched the stores in San Diego for Stone-Buhr flours, but I will definitely be going out of my way to do so now that my samples have run out! And if you do purchase a bag of Stone-Buhr flour, make sure you visit their Find the Farmer Web site that allows you to enter the lot code from your bag of flour and see which specific farms grew the wheat for that batch. Talk about personal connection! You can also follow Find the Farmer on twitter. 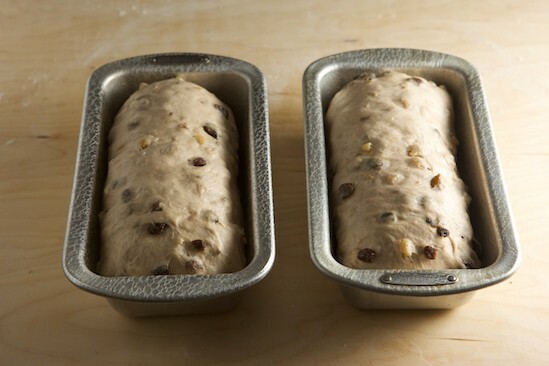 Now who’s ready for some Cinnamon Raisin Walnut Bread? 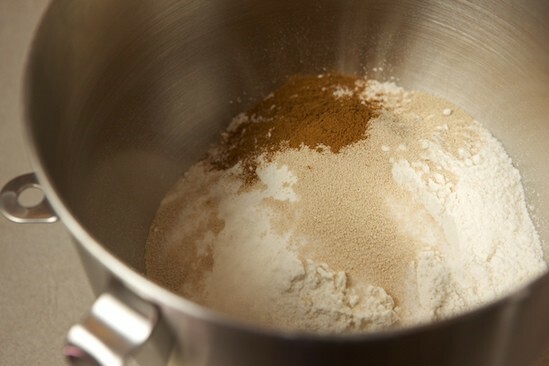 First, I combined flour, sugar, salt, yeast, and cinnamon in a mixing bowl. I used the bowl of my stand mixer since I’ve been very lazy about kneading bread by hand lately! 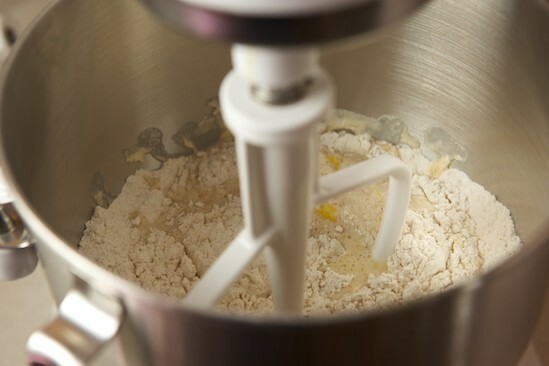 After mixing the dry ingredients, I added the wet ones: egg, melted shortening, buttermilk and water. I mixed everything on low speed using the paddle attachment in my stand mixer. As you can see, the dough was very wet and sticky. So I added some flour until the dough came together in a ball. Next, I switched to the dough hook, and kneaded the dough for about 6 minutes. 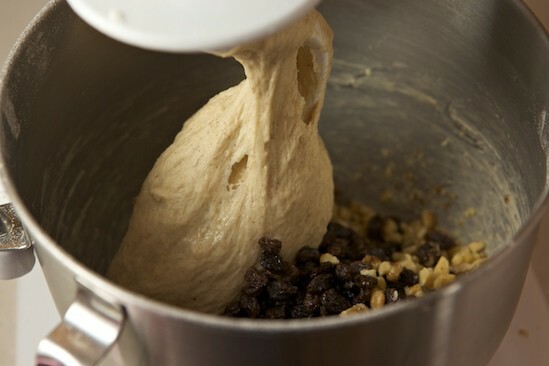 Then I added the raisins and walnuts and kneaded for another couple of minutes. 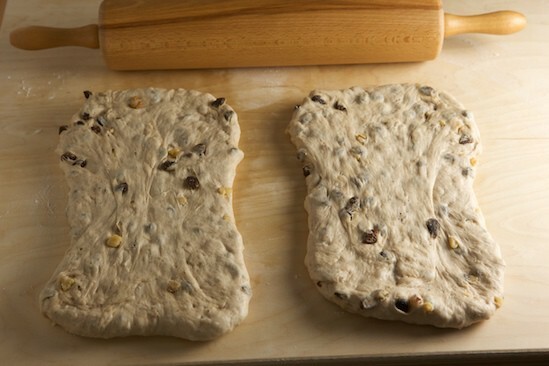 So I dumped the dough out onto my board and kneaded the dough by hand for another minute. It was time to let the dough ferment for a couple of hours. I washed and oiled the mixing bowl and placed the dough back in the bowl, turning it once to coat both sides with oil. After two hours, the dough had doubled just like it was supposed to. I dumped the dough back out onto the board so I could divide it into two pieces. To make sure the two pieces were equal, I used my trusty red scale. Once I had two equal pieces, I rolled them both out into rectangles. For this bread, Mr. Reinhart gave us the option of adding a swirl of cinnamon and sugar to the dough. 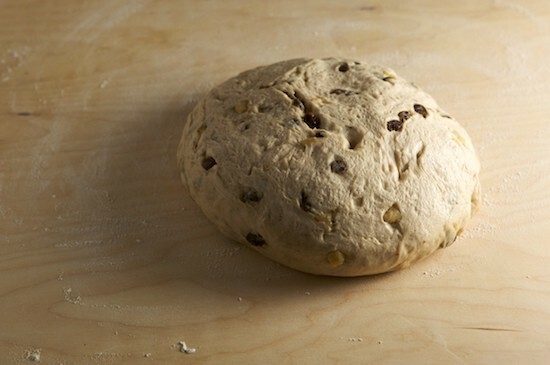 In order to make the swirl, the dough has to be rolled out like this. Next, I brushed each piece of dough lightly with water (the book didn’t say to do this, but it’s what I always do with my regular cinnamon swirl bread) then sprinkled a mixture of cinnamon and sugar evenly over each rectangle. Next, I rolled the rectangles into tight logs. After rolling, I folded each end up and pinched all the seams together well. 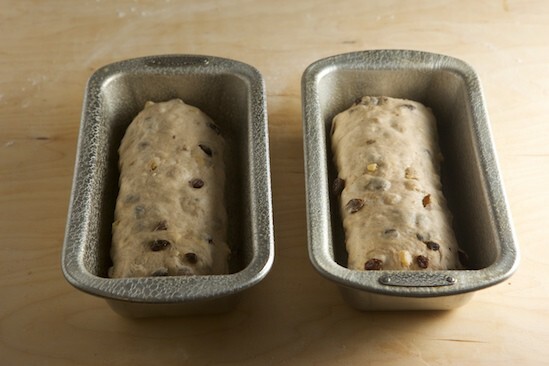 When placing the loaves in the pans, it’s important to put them in seam side down. 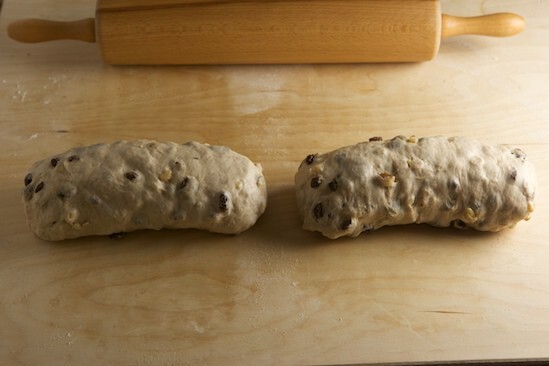 I also gently press the loaves down with the backs of my hands so that they fill the bottom of the loaf pans evenly. After proofing at room temperature for a little over an hour, the loaves had crested the tops of the pans and were ready for the oven! I baked them for about 45 minutes, rotating the pans halfway through the baking time. As soon as they came out of the oven, the tops were brushed with melted butter and dipped in cinnamon sugar. YUM! This turned out to be one of the most amazing breads I’ve ever baked! The texture and flavor was better than any Cinnamon Raisin Bread I’ve ever tasted. And to be honest, I think I like this one almost as much as my Mom’s Cinnamon Swirl bread! That says a lot. After baking the first nine breads in Peter Reinhart’s book The Bread Baker’s Apprentice, I can honestly tell you that it is worth buying. Even if every other recipe in the book turns out to be a dud (very unlikely), the book is worth buying for the first nine recipes alone. And if you’ve ever had a question about baking bread, this book will probably answer it for you. Want to understand how yeast works? Turn to page 60. 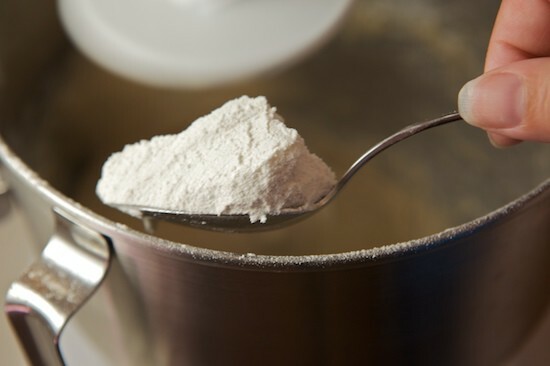 Curious about the differences between different types of flour? 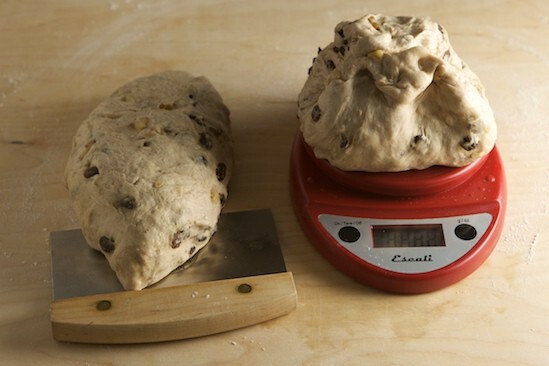 Read pages 29-32 Want to learn how to shape different types of loaves? Check out the wonderful photo tutorials on pages 72-86. As I work my way through the book, I truly do feel like a bread baker’s apprentice. This week we will be making Corn Bread! The corn bread instructions begin on page 151 of The Bread Baker’s Apprentice. Corn Bread might seem like an odd choice for inclusion in a bread book like this, but from the looks of the recipe, it’s going to be a great one! Good luck and happy baking! 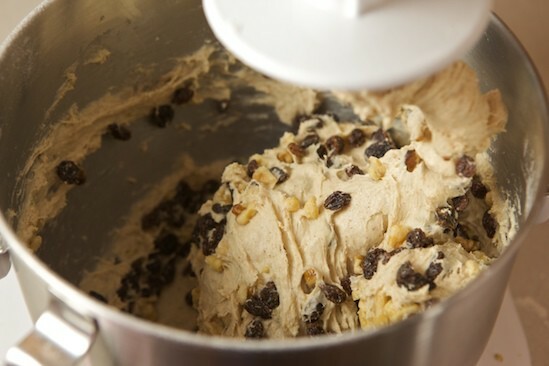 Want to Bake Along With Us? There are several ways for you to join in the fun! First of all, you need a copy of Peter Reinhart’s The Bread Baker’s Apprentice. Read the first section of the book carefully, as this will prepare you for the bread recipes in the second section of the book. 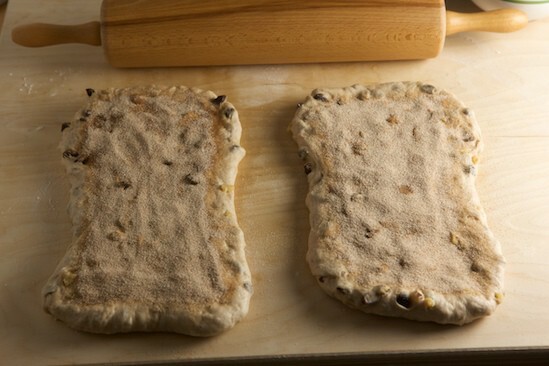 Then just jump in and bake some Anadama Bread! But first, please visit The BBA Challenge Page for more details on how to participate in the group! If you haven’t already, you might want to bookmark the BBA Challenge Page. 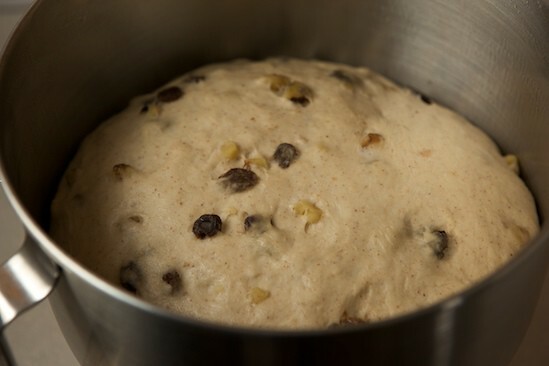 From there you can see which breads are coming up soon, find answers to Frequently Asked Questions, visit and/or add yourself to our World Map, see the BBA Challenge Blogroll, and check out the continually updated slideshow of BBA Bread photos from our ever-expanding group of bakers! For those of you who are participating in The BBA Challenge, here are some questions: How did you like the Cinnamon Raisin Walnut Bread? Did you add a cinnamon swirl? Did you put cinnamon sugar on the top of the loaf? Did you learn anything new while using this formula? 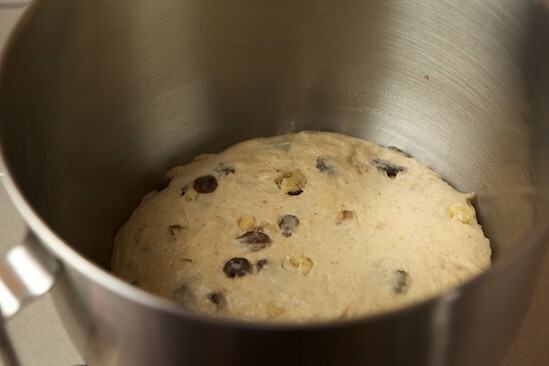 And remember, if you wrote a blog post about Cinnamon Raisin Walnut Bread, or have photos available online, please leave a comment and share your link! This is my favorite bread. My dad bakes it all of the time. I just love it. Makes the best toast in the morning! Nice job! Awesome! I am always on the lookout for new brands to try especially they are small guys who take pride in their work. Definitely going to have to order a couple lbs from them especially since I am due for a KA order anyways.Great write up as always!! We are slowly getting through this! Nicole I LOVED this bread! It was so tasty. I didn't do the swirl but I did put cinnamon sugar on top (the sweeter the better for me LOL) Here is the link to my post! http://www.bellalimento.com/2009/07/10/cinnamon-raisin-walnut-bread/ Of course I had to make french toast with the leftovers & it was Fab! The Corn Bread is one of the recipes I have already made before starting the "Challenge", personally we love it but this is a "Northern" Corn Bread so some southerners may not care for how sweet it is. Wow, your photos are absolutely stunning. This looks so so so good! I can't wait to get to this recipe! This looks wonderful! 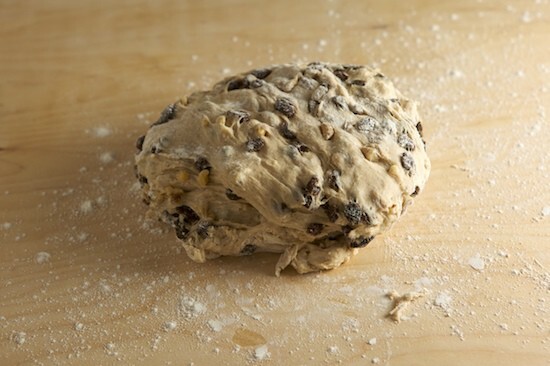 I am actually not a huge fan of cinnamon or raisins (much love for walnuts, though) in cookies or cakes, but bread is different, for some reason. Your pictures, as usual, are amazingly inviting. This is one of my favs....needs to be put under lock and key...gave some away and quickly put my loaf in freezer for hubby! Though I am so tempted to get out and have a slice...your pics are great. Thanks for sharing...Happy Baking! PS the cornbread rocks...even without the bacon! Wow. This looks delicious and I am so impressed by all of the breads you've been baking! Oh my this bread is so good, I love it so much and it is easy to make. I am going to Seattle and will be looking for that flour. Thanks for taking about it. And you are so right, that book is worth every penny. Beautiful pics! First, I love your blog! :) I just wanted to pop in and tell you I literally live in the heart of wheat country in Washington. I live in the county that produces the highest bushel per acre of wheat. Out my front and back doors, I have beautiful views of wheat country. I am originally from Seattle and never thought I could live away from water, but now I have views of "sea of wheat". Also, we know many of the growers on the "Find the Farmer" page. Both my husband and I have worked in the Ag industry here. Anyway, beautiful bread!! Oh, this is beautiful. Far better than any store bought loaf though it indeed looks professional. Well done! Wow, your photos are so good. Bread looks wonderful and flavorful! The challenge looks like it is going well!Get excited for the corn bread! I made it for a BBQ earlier this summer and people chowed down! I can't tell you how many compliments I received. I opted to not use the bacon so that I could be veggie friendly. i never thought i'd say this about a raisin-containing product, but this is perfection. bravo. Great job Nicole. Your bread and your photos are lovely. Thank you for including my link in your lineup! With this endorsement, I'm really looking forward to baking this formula in a couple of weeks when our leisurely group gets there! 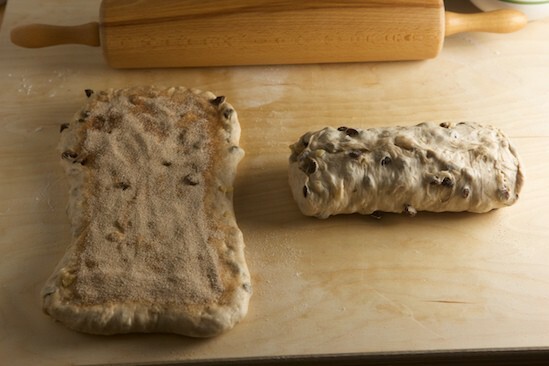 One of my first hand kneaded breads had walnuts in it and I've been hooked on them in bread ever since. The swirl is the way to go, too! 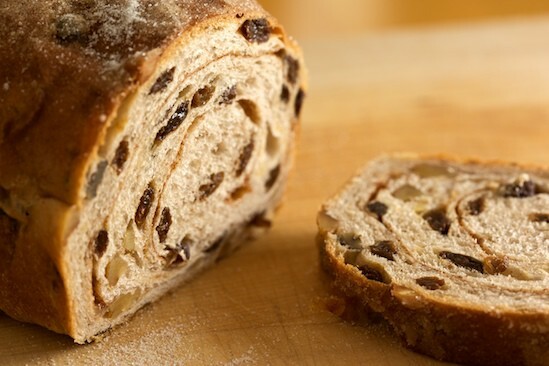 I love cinnamon raisin bread! I love that swirl! I love cinnamon raisin bread. I confess I get the one from my local bakery :P I won't be lazy and start making my own next weekend. Recipe bookmarked! Nicole, I am with you, I prefer cinnamon bread without the walnuts. I liked this bread a little stale, re-heated on a pan with a little of butter, scrumptious!Soon to post the cranberry walnut bread. Thanks for the tip to wet down the bread before adding the cinnamon-sugar swirl in the middle. 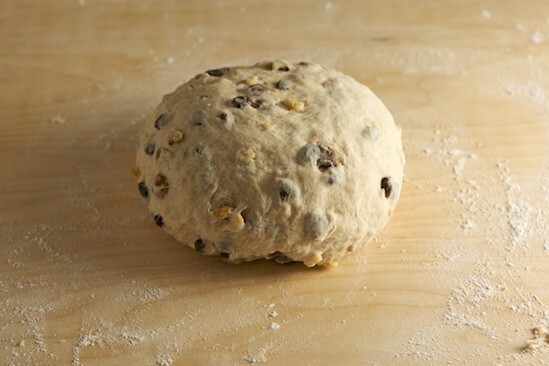 I also will gently press down my dough to fill the pans the next time I bake this recipe. I have already made this recipe three times. My dh (darling hubby) doesn't like raisins, so I subbed cranberries for them. Tasted great. Thanks for starting this challenge. That looks fabulous! Like you, I'm skeptical about adding nuts to my cinnamon raisin bread. I'm really looking forward to this bread. Beautiful! !I just made it today, and man it is DELICIOUS!!! I love this book! 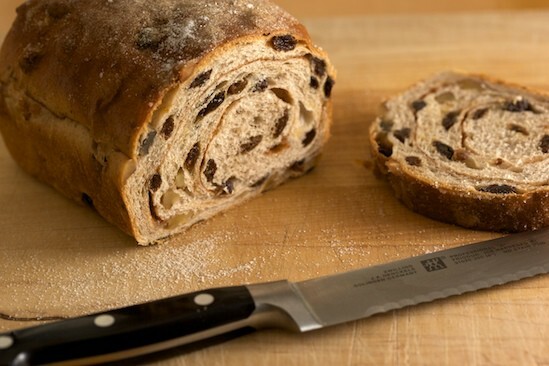 This is truly an amazing cinnamon-raisin bread and I will most definitely be making this! Beautiful! I just made two loaves of this bread this morning and it was amazing -- although, instead of cinnamon raisin bread, I made cinnamon chocolate swirl bread. I added an equal amount of chocolate chips at the same time the raisins were added. The dough was still warm so the chips began to melt and "swirl" into the bread as I kneaded it. It was amazing!! It rose beautifully and was light but with a perfect, tight crumb. I have never loved a cinnamon bread this much. Thank you for inspiring me. where exactly is the recipe? I recently bought this cookbook and made this recipe. Outstanding! I swirled a generous amount of cinnamon-sugar in it and buttered the top and rolled it in cinnamon sugar. I also left out the walnuts....allergy reasons. Hey there! 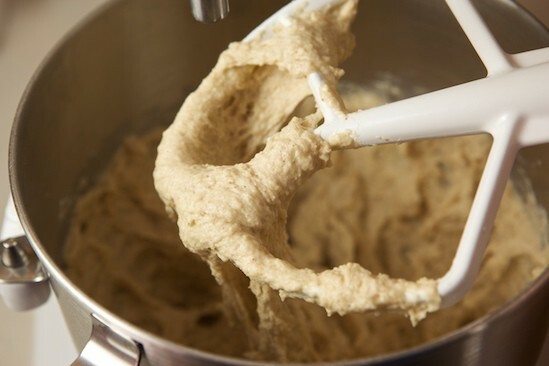 Can I make the dough ahead of time and bake it the next day? If so, how would I go about doing this? Is there a recipe somewhere? This looks so good! Hi there, I’m a non native speaker and what is a ‘seam side’? Thanks!